367. Beta blockers in ACS – indications, contraindications, mechanism / When should ACE inhibitors be started in ACS? Contraindications? / Why are calcium channel blockers not indicated in ACS? Previous PostPrevious 366. 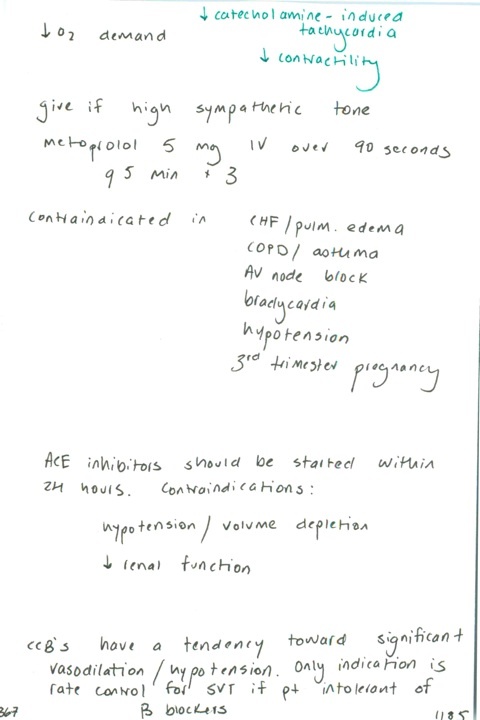 NTG administration protocol and cautions / When should morphine be given in ACS? Next PostNext 368. ASA dose and mechanism of action in ACS / Mechanism and indication for glycoprotein IIb/IIIa inhibitors in ACS / Why is clopidogrel favored vs. ticlopidine?